Home EMPHASIS Erdogan suggests a referendum on EU membership. Is it a new joke? 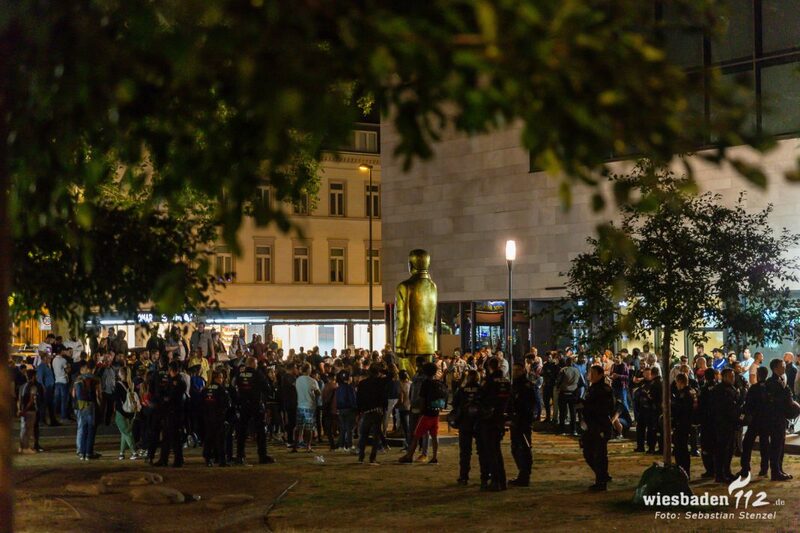 A 4-meter golden statue of Turkish President Recep Tayyip Erdogan had been erected in Wiesbaden on August 27 in the western German city of Wiesbaden. After strong protests it was removed the day after. The question of Turkey’s European future has been widely discussed, especially over the past couple of years. Under Erdogan’s rule, however, Turkey (with a population that has shot past the 80 million mark this year) is finding itself increasingly isolated from Europe and its values and principles. Even though there is a growing political environment in the EU that is generally hostile to the idea of enlarging the Union to a Muslim country, the biggest problem is in Turkey. It is Ankara’s regime seems to be pushing Turkey further away from Europe. Turkish President Recep Tayyip Erdogan is known for his controversial statements directed mainly to an audience fanaticised by the Turkish media, which is suddenly now under his control. He is infamous for threatening his “enemies” and making statements regarding ambitious plans to reclaim the glory of his country. Now, he is proposing a referendum on EU membership. Criticising the EU for keeping Turkey waiting at the gates for so many years, Erdogan said: “But if this goes on like this, with this mentality. This is a headline for tomorrow’s papers. Our duty is probably to go to the 81 million (people in Turkey) and see what the 81 million decide”. Is this another joke? What does the Turkish president really think about the actual situation? Does the EU want to welcome Erdogan’s Turkey? Is Turkey sceptical about joining the EU? Erdogan has avoided reality. Addressing his domestic audience, he has never taken any responsibility for the so many problems facing Turks today. After all, Turkey’s isolation, the collapse of the country’s economy, as well as deep social division over the past couple of years are all his making. Turkey declared from very early on its desire to become a member of the European and western institutions. In 1949, Turkey asked to become a member of the then European Council. In 1952, Turkey (along with Greece) became a member of Nato. Ten years later, Turkey lodged a formal application to become a member of the European Economic Community. In 1963, in response to this application, the two sides signed an “Agreement Creating An Association Between The Republic of Turkey and the European Economic Community”, better known as the Ankara Agreement. But this whole process ended abruptly in 1974 when the Turkish army invaded Cyprus and occupied more than a third of its territory. It is this continuing occupation that still stands in the way of Turkey’s European prospects. The end of the occupation will unblock Turkey’s EU path. It was only in 1987, under the leadership of the liberal and pro-EU Turgut Ozal, that Turkey asked again to join the ECC. In 1999, Turkey finally secured the status of an official candidate country. Negotiations did not begin until 2005. The above timeline suggests Turkey’s interest to join the European family has a long history. A few years ago, the findings of public opinion polls in Turkey showed widespread pro-European sentiment among the Turks. But the situation today seems to be much different. After the EU hesitated a few years ago to show Turkey the way to membership and accept Erdogan’s building of an authoritarian state, he changed his narrative. According to his political needs, EU’s behaviour toward Turkey moves from being negative to openly hostile. The Turks are bombard daily by the regime’s media and feel abandoned and rejected by the EU. But does Turkey have a place in Europe? Despite the fact Turkey was born out of the Ottoman Empire and the two entities are completely different (the latter had a multinational structure and the other is a national state), Turkey claims to be the legatee of the Ottoman legacy. As such, historically the Turks have been a part of the European history since a very long time ago. They were players in the European world from the moment they moved their capital city to the Balkan city of Edirne in 1363. The conquest of Constantinople by the Ottoman Turks, as painful and dramatic as it was for Christianity, marked the stabilisation of The Turks’ power as a European force. Blocked in the east by the powerful Persian Empire, they focussed on the conquest of European land. The Ottoman Empire was officially invited to participate as a key player in European affairs by French King Francis I in 1536. Since then the interest of the Sultans constantly targeted Europe. To some extent, the Ottoman Empire was much more involved and part of the European affairs during the 16th, 17th and 18th centuries, than Russia ever was. Since the early 19th century, the Ottoman Empire tried to adopt new European methods, first in its military and secondly in politics with the 1909 Revolution of the Young Turks. Turkish nationalism was in equal measure aggressive, bloody and intolerant as other European nationalistic movements at the time. The massacre of the Armenians in 1915 had the deep ideological signs of a European kind of nationalism. In 1923, Turkey became a republic following a National Revolution under the leadership of Kemal Ataturk. Since then, except for several breaks of military juntas, Turkey has been a parliamentary republic. Its legal system adopted the European penal and civil codes, secularism was established, and women gained the right to vote in 1936. The deterioration of Turkey’s relationship with the EU is a deed of the Turkish president and his regime. Although there were clear indications, at least since the beginning of the decade, that he planned to establish a heavy-handed rule controlled by him and his cronies, the situation became disparate after the coup of 2016. Using it as a pretext his regime attacked a large part of the Turkish society, inventing a ‘tremendous enemy’, Fethullah Gulen, and accusing of ‘terrorism’ quite everyone is not with him. More than 100,000 people have been jailed, including relatives of his political adversaries and mothers with their children and babies. Imprisoned children in Turkey seems to be a unique case. Hundreds of thousands of civil servants, businessmen, army officers, diplomats, judges, lawyers among other professions, lost their jobs and the means of subsistence. Many had to flee Turkey as political refugees. A large part of Turkish society is condemned to live in poverty for political reasons. The fierce persecution by the regime was expanded to relatives. Indeed, Erdogan keeps as hostages the families of many of his adversaries ensuring their political neutralization. Media freedom was also severely curtailed. The regime shut down newspapers, radio and television stations, persecuted and jailed journalists including the correspondents of foreign media. A major blow was reserved for the economic activities of Erdogan’s adversaries and ‘enemies’. He closed Asya Bank and many small-scale industries, businesses and shops belonging to members of the Gulen movement or to Kurds. Corruption became endemic and many of his cronies are accused of dirty business. EU countries, particularly Germany, have been critical of Turkey and Erdogan’s deeds. Michel Rocard, a former French prime minister and member of the European Parliament, wrote in 2008: “With Turkey in the Union, Europe will strengthen its geostrategic position. This market will be extended. Access to energy roads will be facilitated. European values will gain ground and their influence will grow” (Qui à la Turquie, Hachette, Paris, 2008). This remains true and must be our general principle when we talk of Turkey’s European future. Because it is in Europe’s best interest to have Turkey by its side. But it is just wrong timing. It seems that President Erdogan remembered the EU too late. Today, more than before, no one wants him in Europe. The values he represents are in a direct opposition to both the nature and founding ideas of the EU. His ‘threat’ of calling a referendum remains a poor and shameful test that was invented solely for domestic use. *Theodoros Benakis is a writer and journalist.